Michael and Sawyer wake up as the sun rises, only to find themselves back at the island, and they start to paddle towards it. Meanwhile, Kate gets out of the vents, finds a gun, and knocks Desmond down, who inadvertently shoots the computer. Kate goes to get Sayid to help fix the computer while Desmond tries to figure out how to repair it. Desmond tells Jack and Locke how he got to the island, and why the computer is necessary to save the world. Libby and Cindy are on the beach when they see Jin wash up on shore, and the tail section holds him hostage since they think he's one of the Others. 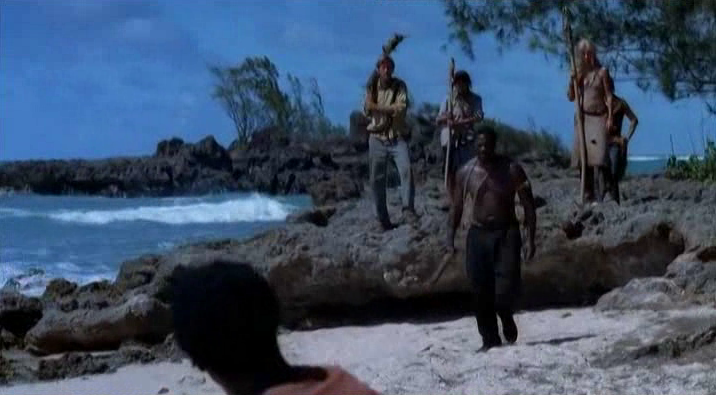 He breaks free and heads to the beach, where he runs into Sawyer and Michael, who have paddled their way back to shore. They see the tail section, and Eko knocks them all out, and they are thrown into the pit. Ana Lucia decides to go undercover and gets thrown into the pit too to find out who they are. While Desmond works on the computer, Jack and Locke watch Dharma's Swan Orientation film. Locke finds it all interesting while Jack thinks it's all ridiculous. Desmond tries to turn the computer back on but blows a fuse and leaves the hatch with 50 minutes left on the timer. After Ana Lucia checks out Sawyer's story and who they are, she takes Sawyer's gun and Eko lets her out. Jack goes after Desmond, really to try and become convinced that nothing will happen if you stop pushing the button. But while doing so Desmond realizes where he knows Jack from, causing Jack to have a bit of a breakdown, trying to deal with this idea of fate, destiny, and taking a leap of faith. Kate resets the fuse, Sayid fixes the computer, and Locke gets Jack to give in and push the button. We close out the episode with Eko letting Jin and Michael out of the pit. Sawyer gets to stay in until he learns how to behave. The episode runs 39:16 and is 326MB to download. You can stream below (via Facebook), or go here to use torrents (better quality, recommended) to download the episodes to your computer.